Bring back the spirit of circus with our Circus Castle Combination. 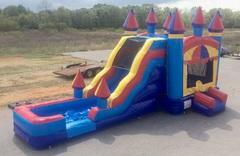 This unit features a 13x13 bounce area, climbing wall, basketball goals and a slide. This unit can be rented wet or dry. It's lots fun either way.